Yes, I’m back from my Italian holidays 🙂 I had a brilliant time, met some really nice people and spent time with my boyfriend’s family. Unfortunately, with the festive days, all the shopping and all the catch up with friends, we didn’t manage to spent much time sightseeing. But I still saw some amazing sights and tasted really good food… and let’s not forget all the Prosecco and Grappa tasting 🙂 I had the opportunity to experience a real “aperitivo” with friends, have home made ice-cream, warm Panzerotti, Pasticciotto, Cartellate amongst others that I don’t even know the name! It was a really nice experience that I want to repeat for sure. I will be showing you my New Year Menu in the next few posts but let me start with the dessert: Tiramissini. It’s my own take on the classic Tiramisu. A few similarities but a bit of my touch to make it different: hence the addition of honey and walnuts. I like to replace sugar with honey whenever possible and I also like some crunchiness on my desserts, so I added nuts. I hope you like. Break the savoiardi biscuits into pieces and distribute by the four glasses. Mix the mascarpone with the honey until you get a soft cream. Add the whipped cream, a little at a time, mixing carefully. Add a hand full of walnuts to the cream. 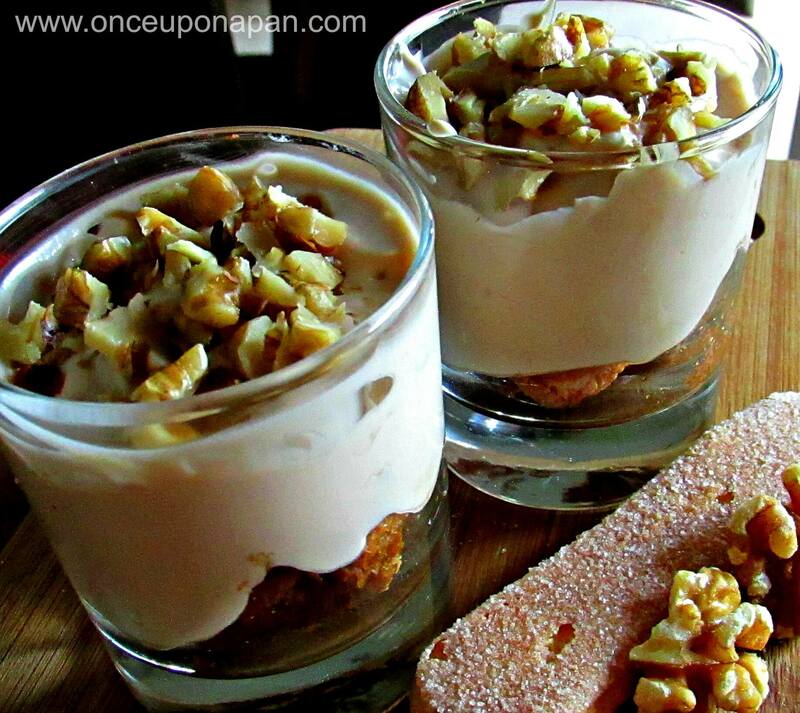 Distribute the cream by the four glasses and sprinkle with some chopped nuts on top.